After a couple days of exploring Rome (Report HERE) we were off to Florence. Just a short two hour train ride away it was quite easy getting to and from one spot to the other. Of course Florence is a different place than Rome and I happened to love them both. That said Florence was the spot that feels like a romantic Italian vacation while Rome was the big city with all the surprises around every corner. Florence was one of the more walkable cities I've ever been except for when the crowds were gathering in the popular areas than it's a madhouse. But it's big enough to where you can avoid the crowds as long as you're willing to avoid the biggest tourist attractions. We still did some of those but as always the areas where the tourists were less scattered were the best places to explore. There's not much I can give you as far as info you cant easily find. I'm here to give you clues on food but there's plenty of other stuff to do besides eat and drink. Florence sees millions of tourists a year and it's population is less than half a million so they know how to host. It's one of the most explored cities in Europe and rightfully so. Not only is the city of Renaissance a gorgeous place that oozes history but it's the capitol of Italy's Tuscany region which has always been a place adored by many. Our first stop in Florence was by chance. As fate would have it this was arguably my favorite place we ate on the entire Italy trip. A little gelato spot called Gelateria Della Passera located in a square is making some amazing artisan gelato. First off you can maybe fit six customers inside. It's a super small space but should the line be long dont hesitate to wait. That said I dont think this is as well known as some of the other spots where we saw tourists lined up around the corner. Not here. There were always customers but never more than a handful. 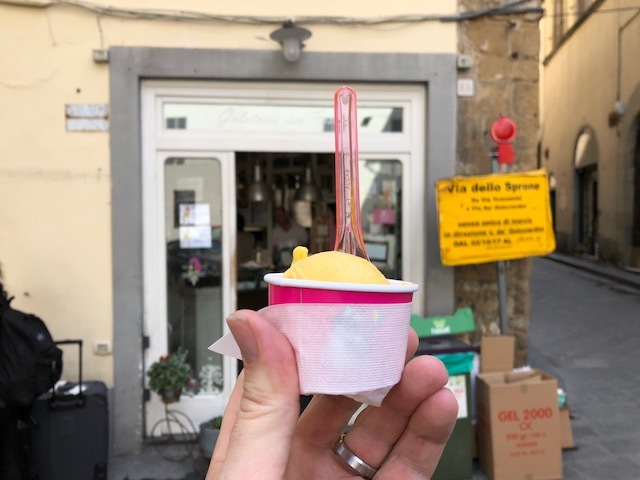 I dont want to ruin the secret but this has to be the best gelato in Florence. It's not served in those tubs sitting in a display case like so many other spots. Flavors are identified by little handwritten notes with art describing them. I LOVED it. To my knowledge it's just a two person team as you cant fit many other people behind the counter. They have a variety of sizes but I kept getting the small one scoop 1e cups so I could try all the fruit flavors. The gelato is stored in small steel containers which the lady will pull out from the freezer upon ordering. It was the definition of small batch. The pear was so good I returned three times for more. Our first food/wine stop of Florence was this ultra popular wine bar that specializes in smaller lesser known wines from around Italy. It's tucked away in a tiny plaza just off the main tourist drag Ponte Vecchio–Palazzo Pitti. It's a small space inside with room for maybe 12 people but they also have a large patio. Aside from some terrific wines they also make killer crostini which is a popular snack in Florence's wine bars. Crostini is just toast with toppings. As you know how it goes with the Italians it's all about simplicity and quality. Their signature crostini is made with thick slices of melted Asiago and truffled sausage. Absolutely fantastic. One of the best bites of the trip no doubt about it. This is maybe the most low key spot we visited this trip. No trace of tourists inside or even outside around the restaurant which sits a bit off from regularly visited spots around the city. While there are reviews of Al Tranvai online there aren't many. I found it by browsing a google map of Florence. This place seats maybe 20 total and the inside felt old school Italy for sure. The menu is a chalkboard which they put onto your table for you to see. I saw a few mentions of fried rabbit in the reviews and that's what we were there for. Though I was intrigued with lots of other stuff on the menu I was happy we went with the Fritta Coniglio bc it was really good. Served fried on the bone some bites were tougher than others but a squeeze of lemon and it was wonderful. A side of fried zucchini was perfect. Florence is small as far as space and size but not so much in terms of the number of tourists. There's lots of spots where you must make reservations if you plan on eating there. Osteria Vini e Vecchi Sapori is definitely one of them. A short walk from the Uffizi Gallery, this tiny spot makes sure you know the deal on their handwritten menu which states: no pizza, no ice, no cappuccino, and no steak. They serve traditional Tuscan food and they're known for a handful of classic Tuscan dishes. As mentioned the menu is handwritten so it does change daily but whatever is on there is sure to be good. For starters a plate of sardines with toast and butter was one of those dishes you just have to order when in Italy. They were a tad salty but I found myself eating one after another. One thing you'll always find on the menu is their signature pasta dish which is pappardelle in duck ragu. This would be her choice and it was a really good one. The pasta in Italy was as good as anything gets. For my entree I went with one of the specials rec'd by our friendly waiter. Beef Cheeks with beans would be what I dove into Tuscan cuisine eating. The cheeks were obviously braised for hours on end in a thick red wine sauce. It might be a pretty bland looking plate of food with just two colors but it was one of those dishes I'll yearn for and probably try to replicate some time this winter. Wonderful. On our first full day in Florence I immediately got up and braved the rain in a walk over to the Mercato Centrale which is the city's most well known market. It's your typical European market by which I mean like nothing we have here in the States. An absolute gem where a food lover like myself can wander around for an hour and imagine all the things I could do in my kitchen if I had access to the wonderful product pushed up and down the aisles. It's definitely a tourist driven place but there are plenty of locals buying food for their homes and restaurants as it's a full fledged market. My main reason for a visit to the market other than to browse it was also to eat. Specifically at a century old place called Da Nerbone. It's one of a few spots at the market where you'll see a constant line. It's only open M-F so act accordingly. You're here for some of the best sandwiches anywhere. All of them are good but it's the roast beef I was most intrigued with. Rare beef is sliced to order. After you order your sandwich you'll watch as one of the guys picks up a roast beef and slices some meat onto a roll that's been lightly dipped into the gravy which the beef rests in. You then have a choice of a tomato based red sauce and or a spicy green variety. The option to make it a combo by adding pork is available and they also do tripe sandwiches. I couldn't help but wonder if this sandwich was a direct descendant of Chicago's famous Italian beef sandwich. It's way too similar not to be. This cozy little trattoria serves lunch on weekdays only. Mario's is the type of spot that caters to a full house damn near every hour they're open. 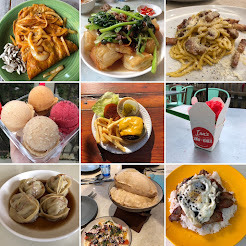 I was told by a few people that it's a must and due to it's close proximity to Mercato Centrale I was able to be there as soon as they opened and was the second person inside. Within 15 minutes the place was full and I was dining with a couple from Rome. I'd say half the people at Mario's are there for the regions famous steak aka bistecca alla fiorentina. Bc I was solo (my wife was still getting ready to start the day) I went back and forth with myself on whether to get the steak which was dumb bc she wasn't going to eat any of it anyway as she much prefers pork. For whatever reason I passed on the steak but in the end I wasn't mad as Mario's cooks theirs on a hot flattop and there were other spots cooking over coal. I got their Osso Buco which came with a rich red marinara loaded with herbs / sausage. It was good but no one makes OssoBuco better than my uncle who's the best chef I know. Too bad for y'all he does it for fun. Also near the Mercato Centrale is this generic tourist sounding bar but boy that it was not. Casa Del Vino was actually pretty hard to find with some construction going on outside of the place. Maybe that's why there was only a couple locals as well as an older guy I presumed owned the place and a younger guy I assume was the protege. I've said it before but it bears repeating often the wine in Italy was awesome. We pretty much asked for suggestions every time we drank some and every time they nailed the request. I loved this place so much. It was small and the walls were packed with wine while the kitchen was also the bar. We got a sampler plate at the recommendation of the extra friendly younger guy while the older one went to work on our order. Italy is a place were simplicity is translated into perfection and if you want perfect chicken liver pate head here immediately. So good. There's lots of foods that can be described as the premier dish of Florence but none are more iconic than the lampredotto sandwich. Otherwise known as a tripe sandwich. This is what Florentines eat and they usually do so standing in the street. That's bc most of the spots that specialize in this sandwich serve them from a cart. For those of you worried that your stomach wont be able to handle cow stomach please picture yourself in a stewed beef sandwich. That's what this tasted like. It was awesome from the tender deep beef flavored tripe to the sturdy bun that held it all together. Must eat. Here's one of the spots sure to pop up when searching for the best gelato in town. It came rec'd in almost every story covering the subject. My friend who spent a few years living in Italy insisted I try it so I made sure we did. The place was packed with people on our visit. It felt rather commercialized if I'm being honest. After the gelato we had at our first stop nothing was going to impress as much. If you like cozy dinners in small spaces make sure you get a reservation here. The name of the place translates to Osteria Three Benches and that's bc there's three benches in the entire dining room. We got a reservation and found our way there via public transportation as it wasn't within walking distance like most everything else. Maybe bc it was a Saturday but the atmosphere here was really lively with a nice mix of what seemed like half locals and half tourists. Three Benches is by no means a tourist hot spot but those that do their homework will end up finding them as the city is so small. For starters we went with the classic Tuscan dish of tuna and beans. This was basically a four ingredient dish and it was as memorable as anything we ate in Italy. Just high quality canned tuna with thin slivers of onions, beans, and oil. When it comes to simple the Italians kill it. Now the real reason for me getting a reservation here was the signature plates of pasta that come loaded with truffles on top. It's what they're known for and what you're here for. You can choose a variety of options. We chose the housemade egg noodles loaded with cream and the truffles for her. My choice was a bowl of risotto since I had not indulged in the childhood favorite of mine. We both agreed hers was better s the risotto was slightly under-cooked though there was none left on my plate as the truffles basically hid the fact the rice wasn't cooked right. Bottom line we loved the tuna appetizer and liked the entrees but there may be better out there for you to find. Good not great. For our Easter Sunday lunch we ended up a spot on my list rec'd in a locals round-up of her favorite Florence spots. Open on Sundays I read it's one of the few eateries in town doing the basics like fagioli all'uccelletto (Tuscan beans cooked in tomatoes and sage) well. While we didnt have a reservation we were able to squeeze a table by arriving before the large crowds which started shuffling in as we were seated. It was all large groups of locals celebrating the holiday with friends and family. We decided to go with a few Tuscan classics while eating here. It seemed that everyone else was ordering a few bistecca alla fiorentinas for their tables. But she doesn't love red meat so I had to pass yet again. But dont worry I got mine. First dish out was the classic Tuscan bread stew known as Ribollita. made with old bread and beans it's a meat free dish filled with lots of flavor when done right. There needs to be a good amount of olive oil but not a ponds worth. Perfect example of peasant food. Along with the ribollita we got a bowl of Fagioli in tomato sauce and also some Galician octopus cooked in a heavy tomato sauce. We liked all of these though maybe we should have got some pasta or something else to go along with all of it. Odss are we were headed somewhere else to eat after. Here's one the wife found that was near our place thus we ended up there twice. Some great service from two younger guys behind the counter resulted in some phenomenal wild boar salami being tried. Thickly sliced with really nice color and little lines of fat. It was almost like steak. Great place. Bc we would be in Florence on Easter Sunday we weren't really sure how the city would look. Not just that but the following Monday is every bit as celebrated so we weren't sure if half the town would be closed or what not. 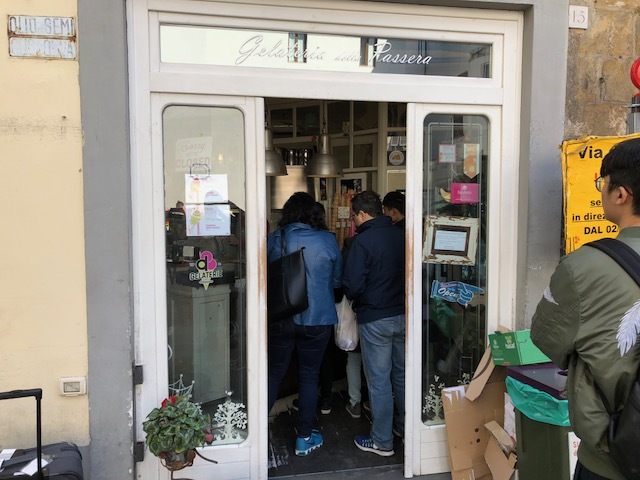 I ended up finding a list of places that would be open and made reservations at Trattoria Cammillo which is a longtime spot run by a family from Bologna. Though it ended up that pretty much the entire city was open on both days we kept our reservation as most places were booked. We watched plenty of people get denied from here and this was probably the most touristy restaurant we went to on the trip. That said it was the prices and location and resulting customer base that made the place a tourist type spot. But the food is actually pretty damn good. Put it like this. If Trattoria Cammillo was in a hip part of a happening city and had a really nice design to it the place would be on every Eater list they make. The food was enjoyed by both of us. the starter of fried zucchini flower was the type of dish that's hard to screw up. We both had pasta and both were of Bolognese descent. She had a bowl of flat egg noodles loaded with butter and bacon. My entree was a dish that i wanted to make sure I tried. My hope was that we would take a daytrip over to Bologna and have Tortellini en Brodo (broth) in it's natural habitat but the holidays scared us off. While Florence turned out to be in full motion Bologna is a bit smaller so we were worried it would be deader than usual. I'm glad I got this here bc it's one of my favorite pasta dishes. Though this wasn't as good as some spots (Monteverde) it was still a real soulful Italian pasta dish. Next up is another great little spot that my wife found. Trattoria La Lola is in the Palazzo Piti area which wasn't far from our AirBNB. This is a nice little neighborhood to walk at night and kind of stumble upon a place. There were a handful of spots that looked good with Lola being the most local. We actually came here on our second to last night in town and then returned for more the next day. First trip in we just split the beautiful plate of Tagliatella Amatriciana up above. It would be impossible to pick a favorite pasta of the trip but this one has stuck with me. Laced with little bits of clams and shrimp it was a fantastic plate of food for something like $10.00 euros. It's what made us return. On our return visit we had more pasta. This time a dish rec'd by our waiter who was happy to see us again. I cant remember the exact contents of this dish but there was sardines, and zucchini involved as well as a nice amount of cheese. Fried Sardines were also wonderful. What more can I say? Italy is a Culinary wonderland. Pretty much every trip report I put out you'll find a spot you wont see on anyone else's round-up. Today's place is called Calistro and I highly recommend you seek it out. You can do so after taking in the views from Piazzale Michelangelo. Located across the river from all the action this little spot is cooking up unique regional Italian food. It's a small space and very popular with young locals so try to arrive when they open which is what we did. You're here for Tortelli which are a regional snack popular in the Tuscan Mountains where the owner is from. They're little pockets of dough stuffed with mashed potato and then topped with a variety of toppings. Until the distinct Italian toppings go on these are like something you'd expect to find on an Eastern European restaurants menu and not something most people think of eating in Italy. That should change. We need a Tortelli food cart in the States. Fiaschetteria Osteria Nuvoli is another one of these distinctly Italian wine bars where they also serve food. Old school spots where you walk in and are greeted by a massive stand of prepared foods such as olives, cheeses, charcuterie, crostini, and more. We love these spots bc they're so casual, the wine is wonderful, and they make for great places to people watch if you can sit outside like we did here. It was our last day in Florence so we had have another plate of Tuscan tuna and beans. Not quite as good as the first stop where we had this but still a delicious plate of food I could eat weekly for lunch. Last meal in Florence. You know what that means. No way I was leaving without trying a Bistecca alla Fiorentina. Giovanni was on my google maps guide and we happened to pass by the night before while perusing the area around Palazzo Piti. We decided it would be the perfect spot to have our last meal in Florence as they're known for a couple of menu items both of which spoke to us. First up was her bowl of Pappardelle with Wild Boar Ragu. That's it. Two things mashing up to make a memorable plate of food. Usually when people get the Steak Florentine it's for two people but bc my wife isn't a fan of red meat it was all for me. I asked for a smaller cut and still got a large hunk of delicious red meat. This was a monster T-Bone that only comes one way. That's salted and cooked to rare. Most places wont cook it past rare and Giovanni is one of them. So no chance of seeing Trump in here. But if you like high quality beef cooked over live fire this is your spot. See ya next time. Note: To find the locations of all the spots featured in this post, as well as places I didn't make it to, please click HERE for my google maps guide to Florence. Very good concepts. This is an awesome post. I think it is very useful for playing casino . This sharing concept is a good way to enhance the knowledge pool about Android Online Casino Malaysia. Thank you very much for this post. Waiting for the next.